Ahh, January. What can I say about my least favorite month? You’re cold. You’re long. You’re at the beginning of the year and don’t really contain any fun breaks or holidays (not forgetting about you, MLK Jr. Day and Presidents’ Day, but you’re not quite as fun as say, Spring Break). We have made it through our first January in North Carolina, and I have to say, although we didn’t suffer through -14F temps like we did last year in New Hampshire, it was still pretty darn cold most days. I struggled to keep up with Lucy the dog’s massive energy, and tried to walk her each and every day, even as my fingers and nose protested bitterly in the wet and chilly 20F temps of the early morning. 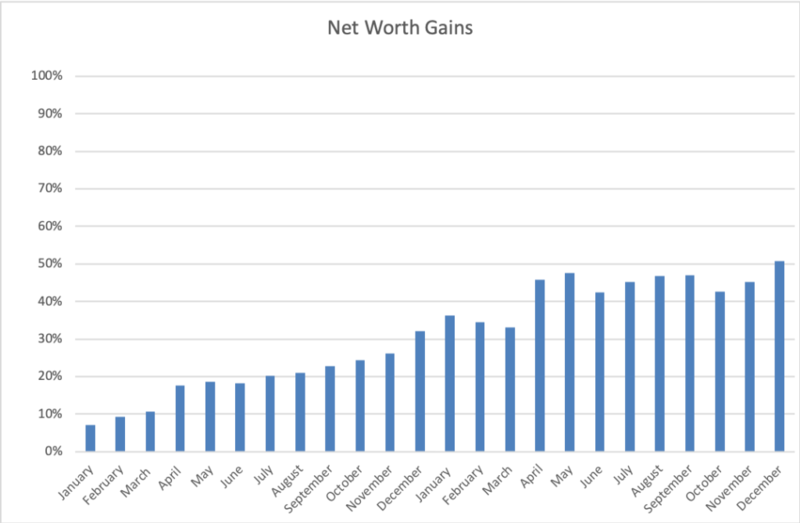 We eeked out another small gain with our net worth this month. We’ve definitely seen a difference in our net worth growth with me not working (it’s been slower!). 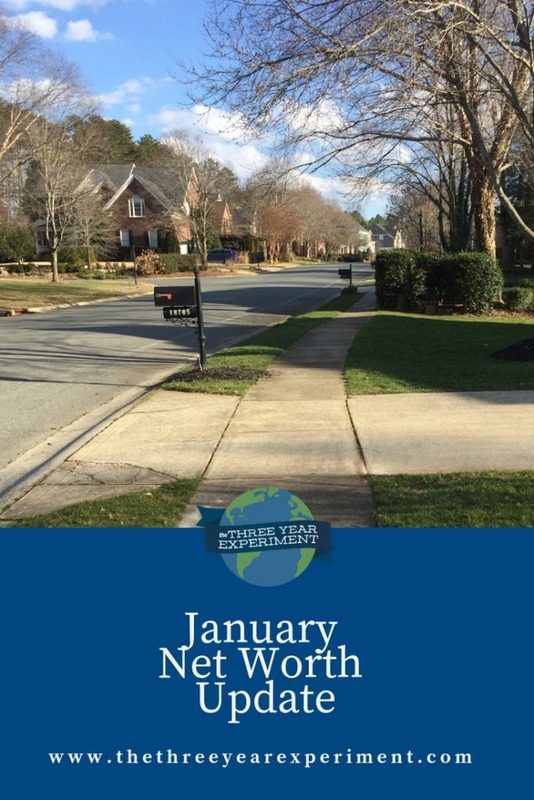 This month, our net worth increased by the tiniest bit, to 51.3%. We’re continuing to max out Mr. ThreeYear’s 401K, we’re maxing out our new HSA (that’s a line item I need to add to our net worth tracker! ), we’re saving in our college fund, we’re saving money in our after-tax fund, and of course we’re paying down our mortgage. Here’s where our net worth stands as of January 31st. Another month of keeping it real with our spending. We are not-a-super-frugal family, so I hope our spending reports are helpful to look at/inspirational if you’re not either. We’re proof that you can reach your financial goals without being extremely frugal, although that certainly helps things along! We’re debt free, except for our 15-year mortgage. We achieved our dream of location independence, so we’re not in a super hurry to reach FI after doing that. We are a high income family, as per this calculator. We are not planning to retire for another ten years. We plan to retire in the FATFire category (here’s the definition of that term). We’re not particularly frugal, although we have been working to get better at our spending for the past decade. We don’t include our mortgage in the spending reports. These spending reports are a way for us to have a more realistic idea of what we’ll spend in retirement, and since our mortgage will be paid off then, we don’t include it. We do include the costs we pay for health care, since we’ll definitely be paying those costs in retirement. Our spending reports don’t show how much we save, only what we spend. But the less we spend, the more we have to save, and that has never been more apparent to us than after getting a month ahead in our budgeting. We use YNAB to track our spending, and we budget a month ahead, meaning we use money from last month (December) to pay for our expenses in January. We did okay spending-wise in January, but we certainly broke the bank in several categories, including Mr. ThreeYear’s and my personal spending categories. The good news is that we kept our eating out to $0, except for one cheat lunch instigated by Mr. ThreeYear. He used his birthday money to take us out for sushi, so I gave us a free pass there. Charity: $83. Compassion International plus $45 in donation to Junior ThreeYear’s school for a field trip, in case a family couldn’t afford to send their kid. Groceries: $993.27 Ridiculous, right? I’m hoping this was an anomaly. It was Mr. ThreeYear’s birthday this month so we had a big fiesta, complete with a fancy cake, and pisco sours (Chilean liquor drink). Plus it was a long month. BUT we didn’t eat out, so we actually spent less in the Food Category this month than we normally do. I’m going back to grocery delivery next month in hopes things go down, though. Eating Out: $0. Well at least this category was the big goose egg! More on this soon. Entertainment: $133.88. 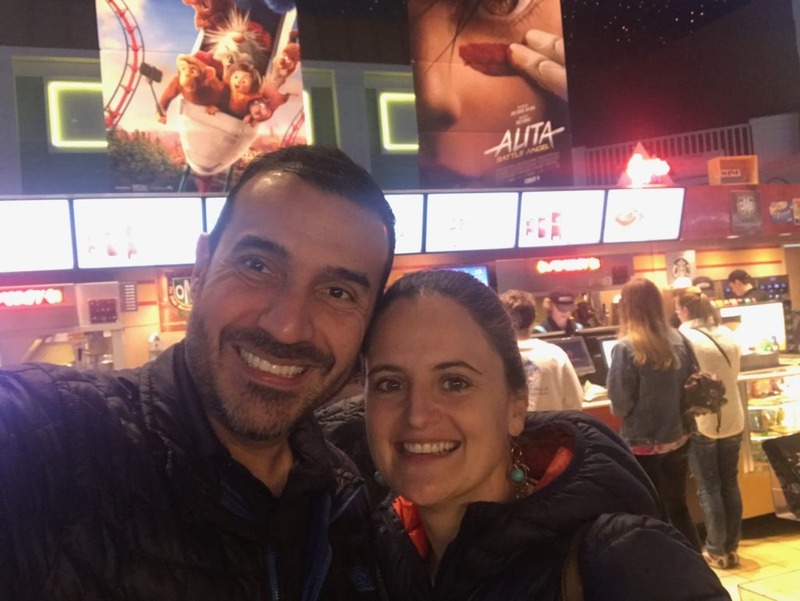 Mr. ThreeYear and I went on a date night to see Bohemian Rhapsody (amazing! ), we played mini-golf with our cousin, and we paid for a tennis event from last month (our neighborhood bills us a month later). Date night at the movies! Fun Money: $743.03. Holy moly this is ridiculous. We both spent a lot this month–Mr. ThreeYear spent almost $500 for an upgrade in American Airlines status that his work won’t cover, because he travels so much and it will make travel much more comfortable (seat upgrades, airport lounge access, etc). I spent over $100 on a special outing with a friend as a thank-you for hooking me up with a (very well-paying) tutoring gig. Gifts: $136.45. January is always a tough month for gifts, because we have a lot of family birthdays. This includes a gift for Mr. ThreeYear (Fairytale Brownies, sooo good), a gift for a dear friend of ours back in New Hampshire, and a gift for my sister for her upcoming baby shower (she’s going to have my niece in April!!). Health Insurance: $598.68 This year, we switched to a high-deductible HSA account. We pay just over $199 per pay period (January had three paychecks) and have $250 deducted out of each paycheck for our HSA account (which I count as savings). Fitness: $321.50. This includes our swim/tennis dues and several clinics (group lessons) for Mr. ThreeYear and me. Since we’ve moved to North Carolina, we’ve decided to prioritize fitness. Clothing: $198.57. I actually bought some clothes this month! $55 of this was for new tennis outfits and just over $100 was for new tennis shoes for both of us (mine had holes). 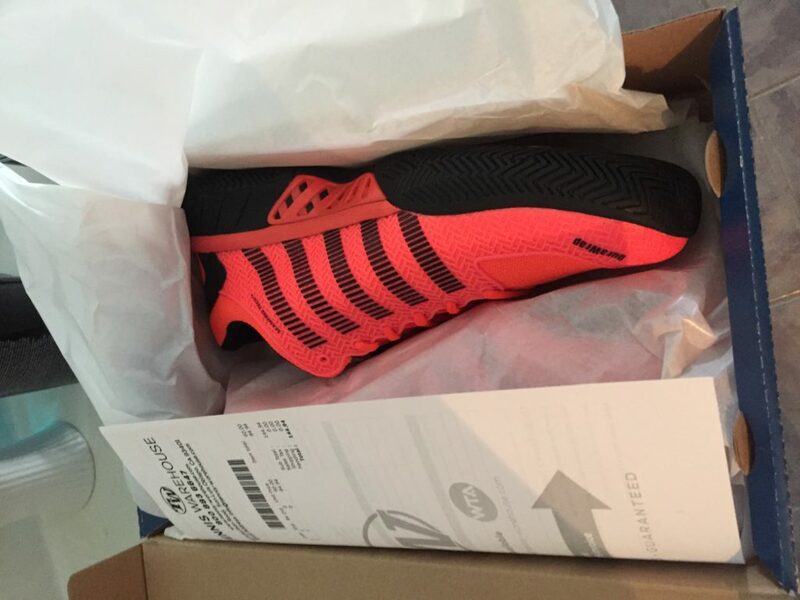 We both got fancy new tennis shoes. Haircare: $46. Haircuts for all three boys, Great Clips. Home Maintenance: $504.03. We bought a lot of stuff for the house this month: 4 bar stools on FB Marketplace for $200 (used as per usual), 4 chairs for our kitchen table since one broke ($40, used, FB Marketplace), curtain rods and curtains for the living room and den windows, a new toilet bowl seat for the guest bath, a new lamp and shade for the living room, AND a new (to us) washer and dryer that my sister sold us for super cheap plus the cost of rental truck to bring them to our house. I suspect we’ll have another year of higher-than-normal home maintenance costs as we fix small things in the house that need work. 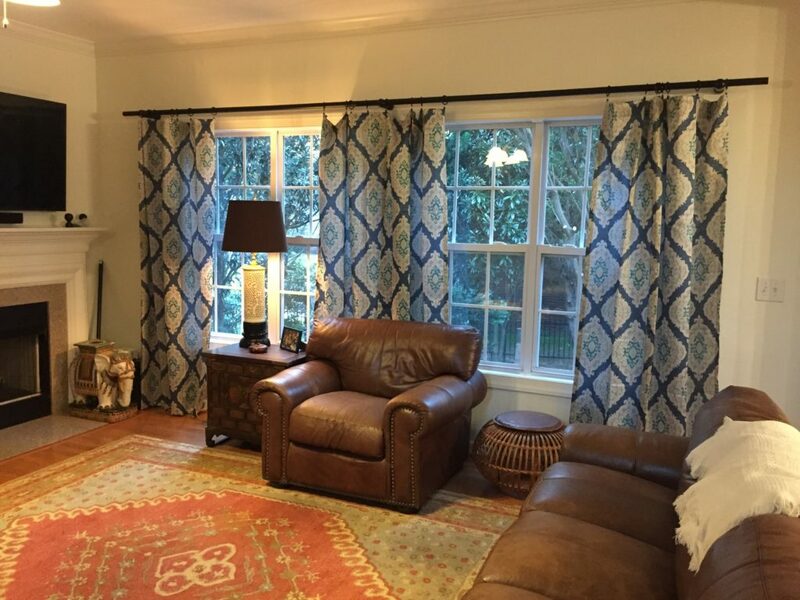 We put up a new curtain rod and curtains in the den and living room this month (from IKEA and Wal-mart–we’re pretty happy with the results!). Household Goods: $26. Dongle for FitBit (didn’t work, returned for refund), cleaning supplies from Target. Housekeeper: $30. One-half of bonus we paid for the housekeeper at the beach house. Babysitter: $56.84. Used the “Bambino” app for a babysitter (expensive!) for our date night babysitter when we couldn’t find anyone else. Lessons & Activities: $97.14: 2 sessions at Cliff Hanger, Junior ThreeYear’s climbing group, and $45 for Junior ThreeYear to attend a field trip at middle school. Allowance: $36.81: Junior ThreeYear’s science teacher created a zombie role-play board game, so I bought it for him as part of the allowance I never give him (got to get better at this!). Pet: $25.08: Lowest monthly expenses yet! We didn’t have to buy dog food this month, just a couple of rounds of treats and bones at Dollar General, my favorite place to stock up. Auto insurance: $539.28. Twice a year. Much higher with the new car. Gas: $44.05: I have no idea why our gas was so cheap this month. Guess we haven’t been driving much. We each filled up once. Internet: $54.95. Finally on autopay. Subscriptions: $37.94. Ooma, Spotify, Skype, Netflix. Natural Gas: $125.38. Higher because we’ve been using our fireplace a lot. It’s cooooollld in North Carolina too (just not as cold as NH and no snow). Water & Sewer: $78.22. Apparently there’s a lovely twice-a-year-assessment that made our bill jump up. Water usage stayed the same though. Cell Phone: $36.76. Through Total Wireless. We have made it through the first month of the year. 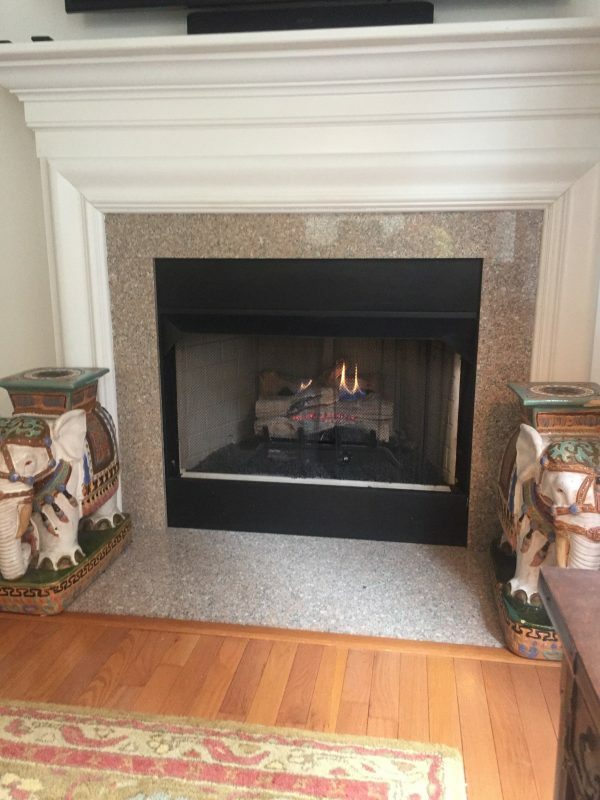 I’m excited to see what this year will bring in terms of average bills (especially utility bills) in this house. Smaller house = less $$ spent in utilities. Hopefully we’ll be able to spend less on home maintenance as the year goes on. We don’t have any exciting plans for February, so I’m going to work on keeping spending as low as I can, although my parents will be here this weekend, and we are planning some more expensive outings. But after that we’re going to work to keep February low-key. Have you tried the crea clip? I’m not sure if it works for boys but I have them and that’s what I use to cut my hair myself. I trim Jared’s hair too but his hair is curly so all I do is make it shorter. Somehow I missed your comment! I am going to check out this magical crea clip. I’ve been wanting to try trimming my own hair! Stay well over there–it’s flu season here and people are dropping like flies!